This is going to take a lot of sorting through. Ever heard of Gustaf Mannerheim? Me either. Not, that is, until I started wading through an unorganized pile of loose stamps left behind years ago by my wife’s late uncle. And the moral is: We could learn a lot from stamps, if only we still mailed each other letters and bought the commemorative stamps I assume the post office still puts out. Don’t remember much about the Mormons? A 3-cent Utah centennial stamp from 1947 may cause you to look it up, as it did me. “This is the place,” the stamp says, and the man who said it was Brigham Young, pictured on the stamp with his wagon when he first saw the Salt Lake Valley. The old stamps before me have plenty of other info. Football started in1869, the American Bar Association in 1878. The Battle of Gettysburg took place 100 years before a 5-cent stamp reminded people in 1963. And so forth. I was puzzled by two stamps issued by Spanish Guinea in Africa in 1959. Both picture bicycle racers, one crossing the finish line and waving. If anyone can fill me in on 1950s-era cyclists from what now is Equatorial Guinea, I’d appreciate an email. So what about that Mannerheim fellow? The 4-cent U.S. stamp in the pile has a picture of him in a fur cap and calls him “champion of liberty.” Google made it easy to learn more. He was born in 1867 in Finland when it was part of imperial Russia and died in 1951. He served in the Russian Army as a young officer, returned to Finland after the 1917 revolution, then led the Finns in fighting the Soviets before and during the Second Wold War and, having lost to superior numbers, negotiated a peace deal with the Soviets that preserved Finland as an independent nation. Quite a guy. Although not related to the stamp I’d suggest the now playing Spielberg movie “Bridge of Spies” starring Tom Hanks about the guy who negotiated the release of downed U2 Francis Gary Powers held by the USSR. Quite a story of our times past. I agree with Tom. This movie is a must see. Commemorative stamps nowadays? Sure. Interesting, memorable, educational, attractive? Few if any I’ve seen this century. I clearly remember the “Transistors” stamp – that, and an old-fashioned radio stamp in the same series, are among most attractive U.S. stamps ever, in my opinion. As for collecting stamps, I have painfully come to the realization long ago, that collecting _anything_ is a horrible disease, not a hobby (at least for me). Same can be said for coins… I never did find that “1909 SVDB” penny when I was a kid, but found many of the steel pennies of WWII vintage.. I have a theory that the stamps of today will be more valuable than the stamps of yesterday. Stamp collecting has declined as a hobby (as was mentioned, folks have electronic ways to pass the time now). So the number of stamps saved from the print runs has also decreased. The population has increased. This may mean a greater demand years from now for today’s stamps. 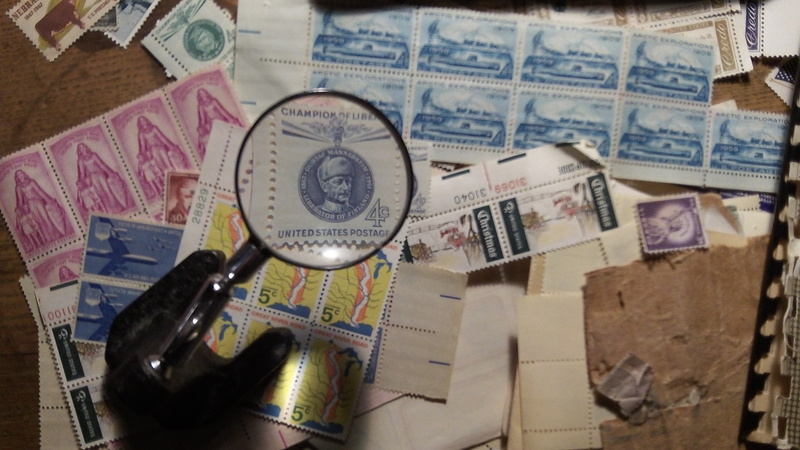 Who knows, but I agree that stamp collecting is a cool way to discover history.